One of the first things a biomedical researcher learns is that it’s very hard to grow most human cells in the lab for an extended period. In fact, once removed from the human body, most cells will either die immediately or reproduce only a limited number of times. That’s why it was so significant in 1951 that this barrier was overcome for the first time, using cancer cells taken from a 31 year old African American woman named Henrietta Lacks. These “HeLa” cells had an amazing property not seen before: they could be grown continuously in laboratory conditions. That’s right, the HeLa cell lines were perpetual, everlasting, death-defying, or whatever other word you want to use to describe immortal. This property meant that researchers would now have a handy stock of cells available for their experiments. It also meant that rather than each researcher using different cell types, labs all around the world could have access to cells of a common origin for their experiments. And that’s just what happened; in short order, HeLa became the human cell line for all kinds of scientific inquiry. While other immortalized lines are now available, HeLa remains the most widely used cell line in biomedical research. In fact, they are referred to in more than 74,000 scientific publications. 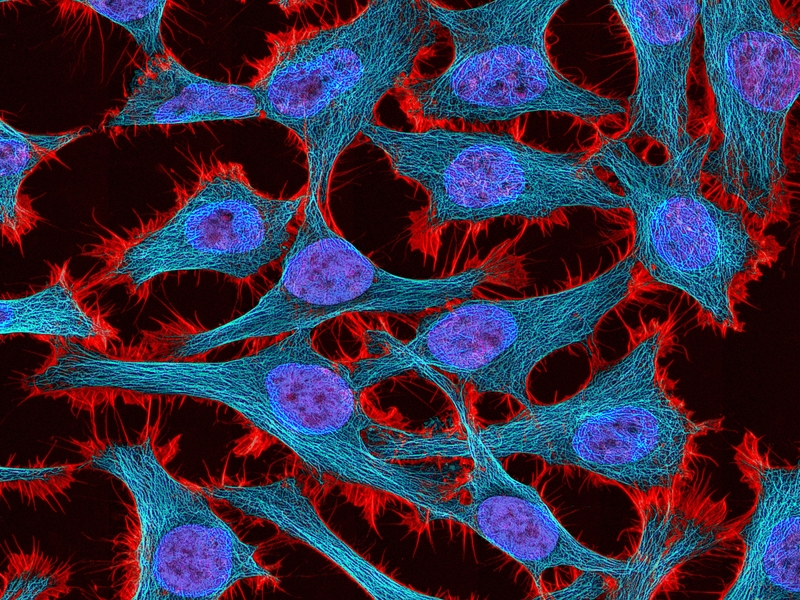 HeLa cells have been used to explore the complex processes involved in the growth, differentiation, and death of cells—processes that underlie a vast array of human diseases. HeLa cells have also served as the foundation for developing modern vaccines, including the polio vaccine; understanding viruses and other infectious agents; and devising new medical techniques, such as in vitro fertilization. Along with these impressive benefits have come some thorny questions, particularly in the ethically charged area of the protection of research participants. You see, the tissue that gave rise to the incredible HeLa cell line was obtained without the consent of Ms. Lacks, during a biopsy for cervical cancer at Baltimore’s Johns Hopkins Hospital. At the time, more than six decades ago, this was the norm because there were no rules about using tissue left over from clinical procedures in research. Ms. Lacks died shortly after her diagnosis, but the scientific uses of her cells are still having ramifications for her children, grandchildren, and other blood relatives. Her story, and theirs, has been told in The Immortal Life of Henrietta Lacks by Rebecca Skloot. The book, which has spent 125 weeks on the New York Times best-seller list, has introduced millions of people to the Lacks family and their extraordinary saga. This spring, German scientists sequenced the genome of a HeLa cell line and published the data—data with the potential to reveal some very private information about Ms. Lacks’ descendants, including their risks of various diseases. After outcries from the Lacks family, scientists, bioethicists, and many others, the HeLa genome sequence was removed from a public database. That controversy, along with other researchers’ desire to publish their HeLa genome data, catalyzed discussions between NIH and the Lacks family. Dr. Kathy Hudson and I travelled to Baltimore on three occasions to meet with the family in order to seek ways that would give biomedical researchers access to the HeLa genome data, while still protecting the family’s privacy and acknowledging their enormous contribution to medical research. Today, after more than four months of discussions, I’m gratified to report that we have come up with a mutually acceptable agreement that will serve both to advance medical research and to protect Ms. Lacks’ descendants . We have agreed that NIH-supported researchers will deposit any DNA sequences derived from HeLa cells into NIH’s dbGAP database, and have established a process through which researchers can request controlled access to that data. Such requests will be reviewed by a working group consisting of physicians, scientists, a bioethicist, and two members of the Lacks family. In addition, the agreement asks researchers who use or derive genomic data from HeLa cells to acknowledge the contribution of Ms. Lacks and her family in their publications. For examples, check out this landmark HeLa genome paper by a University of Washington team in this week’s issue of the journal Nature  and another by the previously mentioned German group in the latest issue of the journal G3 . It’s most unfortunate that Ms. Lacks did not receive the thanks she deserved from researchers during her lifetime. However, I’m glad that we now have a chance to thank the Lacks family for continuing to share her enduring legacy with the biomedical research community. Their generosity extends to the millions of people who have benefited, or will benefit in the future, from research using HeLa cells. Biospecimen policy: Family matters. Hudson, K.L., Collins, F.S. Nature. 2013 Aug. 8; 500: 141-42. The haplotype-resolved genome and epigenome of the aneuploid HeLa cancer cell line. Adey, A., Burton, J.N., Kitzman, J.O., Hiatt, J.B., et al. Nature. 2013 Aug. 8; 500: 207-11. The genomic and transcriptomic landscape of a HeLa cell line. Landry, J., Pyl, P.T., Aiyar, R.S., Pau, G., et al. G3. 2013 Aug.; 3:1213-24. It is immensely gratifying that the NIH and the Lacks family came to an amicable resolution about the DNA sequences of multiple HeLa strains. I have two comments on the subject, one on the Lacks family, and the other on HeLa cells. First, I strongly believe that the Lacks family should be reasonably compensated; the contribution of these cells in science cannot be enumerated by dollars. The compensation could be for the elderly and the sick in the family, and, more importantly, for the children to ensure their future education. The JHU should take the lead in partnership with the vendors who sell these cells, and other philanthropists (in science). I assume NIH cannot be a partner in this venture. My second point is about the cells per se. I first came across HeLa cells as a postdoc in 1972. There were only a few Hela cell lines at that time. Our mentor, the late Dr. Leonard Tolmach (the fame of the technique of mitotic collection) decided then that we must first clone the cells to avoid any heterogeneity and continuity with the same cell line in years to come. We froze down 100+ clones with the idea of thawing one ampule every year. HeLa today is very different from the HeLa of 1951. I suggest we stop all work with HeLa, especially when it needs to be compared with another work on HeLa. There are many other choices of cell lines today. HeLa of 1951 is now dead after having lived a very fruitful life! I read Skloot’s informative book and I’m glad to know there will be more accountability and acknowledgment for the Lack’s family but I believe they’d like to receive financial compensation for the trauma this caused in their lives. When might that happen? The power of the pen lives on.